From Amazon: When sixteen-year-old Zoey Redbird gets Marked as a fledgling vampire she must join the House of Night school where she will train to become an adult vampire. That is, if she makes it through the Change. But Zoe is no ordinary fledgling. She has been chosen as special by the Goddess Nyx and discovers her amazing new power to conjure the elements: earth, air, fire, water and spirit. When Zoey discovers that the leader of the Dark Daughters, the school's most elite group, is misusing her Goddess-given gifts, Zoey must look within herself to embrace her destiny - with a little help from her new vampire friends. Not suitable for younger readers. This seemed to take a while to grab my attention but once it did I really enjoyed it. I like the premise – that becoming a vampire is a biological change that you either survive or don’t - as it was a different take on the vampire mythology. I found Zoey a likable character – her friends too - and I liked the direction the story took with Zoey and her abilities. 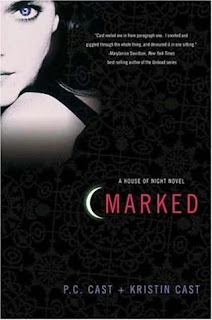 Also, I felt there is enough intrigue in the house of night school to keep things interesting in future books. Overall I really enjoyed it and by the end I couldn’t wait to read the next instalment. Great review, and looking forward to hearing what you think of the next one too! I like the premise too, the teen speak just annoys me. Glad you enjoyed it!